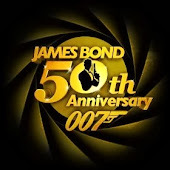 This Blog is dedicated to discussions surrounding the character and culture associated with James Bond. Includes discussion of 007 films, novels, product tie-ins, and the people behind the scenes from Ian Fleming to William Boyd and from Sean Connery to Daniel Craig. Anyone who is familiar with the novels or films featuring the James Bond character knows that although 007 is an unmatched sharpshooter with his Beretta and later, his famed Walter PPK, he is also very capable of defending himself in an unarmed, hand to hand situation. Virtually every work has him, at some point, squaring off with an opponent, or henchman without the aid of a firearm. So what fighting style is Britain's favorite fictional son skilled in? Kung Fu? Jui-Jitsu? Taekwondo perhaps? Even as a Bond fanatic over the years, I never really, seriously contemplated this question until now. While the answer may vary slightly from Bond persona to Bond persona, it seems 007 may have been a real frontrunner in the Mixed Martial Arts (MMA) arena before it was even called MMA, and he is certainly a man whose hands are to be feared. Going back to the source material, as I always do, Ian Fleming's Bond references our hero training in British Naval Intelligence. This training would, likely, be a form of what has been referred to as Close Quarters Battle Combat, an unorthodox, little documented fighting style that involves deadly blows and the use of economic, crippling strikes which can be executed in close proximity to an opponent when locked in close combat, hence its name. There is also some reference to boxing in his youth and, later in the military which is evidenced throughout all the Bond personas with his striking blows. 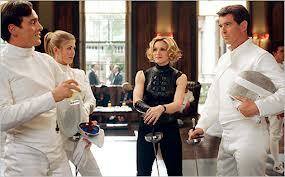 Fleming's Bond also references some Combat Judo training. Eastern style Martial Arts training is very common today in the West. Varied styles, from Karate to Taekwondo to Competitive MMA, are taught throughout Europe and the United States; however, this was not the case in Fleming's day. Martial Arts study was a closely guarded secret of the East and many Asian countries had strict prohibitions on teaching their secret arts to Westerners. It is no surprise, with Fleming's background, that Bond was a well versed combatant with his hands and in the Asian martial arts. He adeptly kills his arch-nemesis, Blofeld, in the epic novel On Her Majesty's Secret Service, not with an assassin's bullet but with his bare hands. Fleming's Bond is a dangerous secret agent with, or without, a weapon. Sean Connery is heralded, in the pre-Daniel Craig era, as a tough guy without question. Connery even did many of his own Bond stunts. Connery, himself, was a student of Karate, and his swagger, confidence, and skill are evident in his portrayal of Bond. His Bond persona was good with his hands, whether it was defending himself against Red Grant in From Russian With Love (1963), or his prowess in the deadly elevator fight in Diamonds Are Forever (1971). In You Only Live Twice (1967) Bond's Judo skills are evidenced in many of the fight sequences in Japan and, later, he is trained in the art of Ninjitsu, under the supervision of Tiger Tanaka, in preparation of his infiltration of Blofeld's Volanic hideaway. One of the widely and wildly circulated story's emanating from Connery's return to Bond in the non-Eon Productions Thunderball (1965) remake, Never Say Never Again (1983), is that Connery is alleged to have had his wrist broken while undergoing martial arts instruction, and a possible disagreement with, non other than Steven Seagal. In true Connery "tough guy" fashion he ignored the pain until well after the production was wrapped on the film, only to discover that lingering pain was a broken wrist. 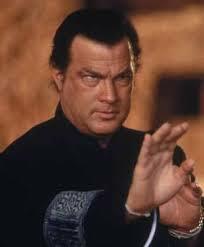 While Roger Moore always appeared to be more concerned about his hair and appearance to get his hands dirty, he was, in fact, an adept Karate student of Aaron Banks. There are numbers of hand to hand sequences in the Moore films, many include "karate chops" and some low kicks and many campy uses of props but his fight scenes never reach the intensity and grit of Connery's, or later, Craig's, fight scenes. Moore understood his limitations in this area, and opted for cunning rather than grit in gaining the upper hand on his opponents in hand to hand combat scenes. 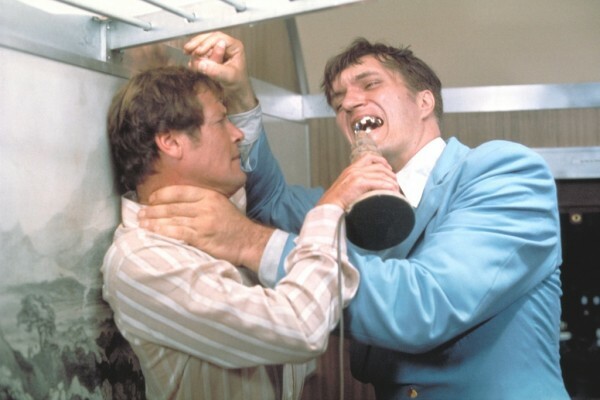 The series aided this paradigm by introducing characters such as Tee-Hee of Live and Let Die (1973) and Jaws from The Spy Who Loved Me (1977)and Moonraker (1979) to make Moore's mortal fighting deficit seem less personal in light of these super-villains extraordinary strength and size. Like many other aspects of the film series neither Timothy Dalton nor Pierce Brosnan made very memorable contributions in the perpetuation of Bond's reputation as a skilled hand to hand combat expert. Dalton is a grittier in his portrayal and more believable as a hand to hand tactician. Brosnan is clearly the most debonair of the Bond actors, but he is the least believable in the "mano-a-mano" arena unless you consider George Lazenby's fighting style, which I choose not to ever consider. Both Bonds hold their own with their hands when appropriate but neither performance had audiences hankering to learn to fight like Bond. After these lackluster years for lovers of good, manly combat scenes along came Daniel Craig, a gritty, brawler who is skilled in the lethal art of Krav Maga, the martial art of choice of the Israeli Defense Forces. This lethal art combines kickboxing, karate, wrestling, street fighting and Close Quarter Combat. Craig was trained by Darren Levine, founder of Krav Maga Worldwide. The emphasis in Krav Maga is "continuous motion" and this emphasis is exhibited in dynamic form in the amazingly memorable and riveting scenes in Casino Royale (2006) as the one were Bond does mortal combat with Obanno and his Ugandan mercenaries who are are seeking a return of their funds from Le Chiffre one way or another. 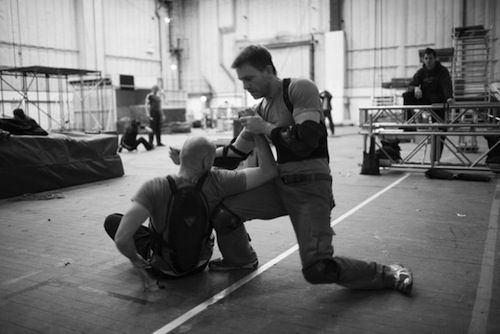 Craig is believable in the role and believable in the fight scenes. These fight scenes have moved beyond the formula, and sometimes gimmicky, fight sequences audiences had become used to in Bond films and, like the film, into a new grittier, dramatic World of James Bond. These fight sequences are engaging, brutal good film making and remind us that, while Bond is far from a super hero, he is a dangerous and skilled combatant. Jeffrey Deaver's outstanding James Bond treatment Carte Blanche delivers us a gritty, Craig-like Bond who is skilled in the art of Systema, a Russian fighting style that is designed for close quarters and defense against guns and knives. The key in Systema is the use of an opponent's own energy against them and the focus on key pressure point areas of the elbows, neck, knees, waist, ankles and shoulders to control them. Systema fighters exert little energy and move very efficiently, often giving them the ability to outlast their opponents before crippling them with their effective striking points. Deaver graphically depicts several fight scenes in his novel with such color that one can envision them taking place. In fact, his depiction was so colorful it immediately drove me to seek out and observe the work of Martin Wheeler, one of the foremost Systema practitioners and teachers in the world in the hopes of learning more. For true Bond Traditionalists they would rather see Bond fight an opponent with his hands than with his exploding pen, and Deaver gets it. James Bond, at his core, is a government assassin. Whether it is under Fleming's "License to Kill" or Deaver's "Protect the Realm...by any means necessary" Bond is is a deadly force to be reckoned with. When most people think of James Bond, they envision the iconic opening sequences of so many of the Eon Production films where Bond turns, fires a single shot, and blood runs down the frame. While there is no question that Bond's skills with a gun are unmatched, he is equally deadly in a close contact combat situation with his hands. Given a choice, which Bond would you stand the best chance of holding your own against in a fight? Which Bond Theme Song Is #1? Which James Bond Is Your Favorite? Copyright 2013 World of Bond. Simple theme. Powered by Blogger.